I’ve got to apologize in advance that I don’t have more to say today. I’m writing this post quickly before leaving on my vacation and scheduling it for later. Hopefully you understand why I’m in a rush! 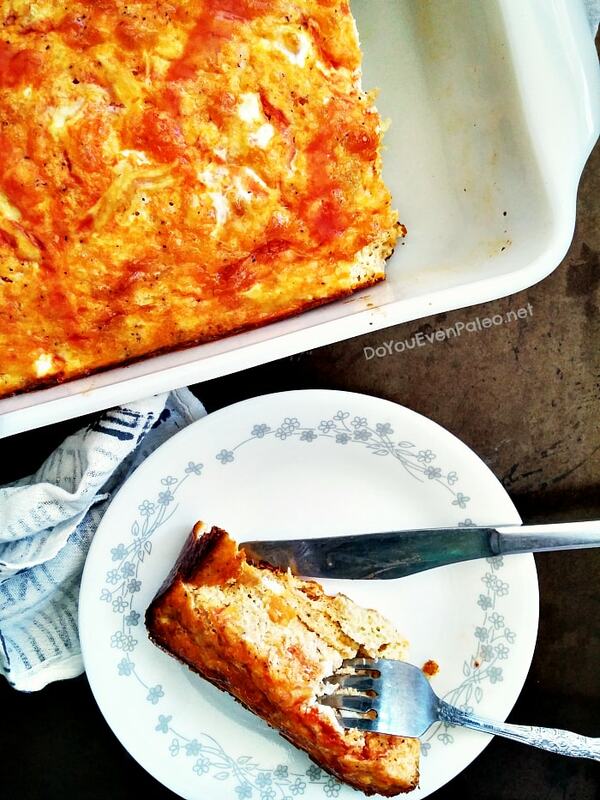 I created this recipe a looong time ago while experimenting with leftovers and egg bakes. Like many of my early creations, I didn’t write down the recipe and therefore completely forgot I had made such a thing (even if it was totally delicious). That is, until someone going through my old Instagram photos (from over a year ago) asked for the recipe and I realized I didn’t have it. Remembering how awesome it was, I decided I’d better test it again and post the recipe this time! 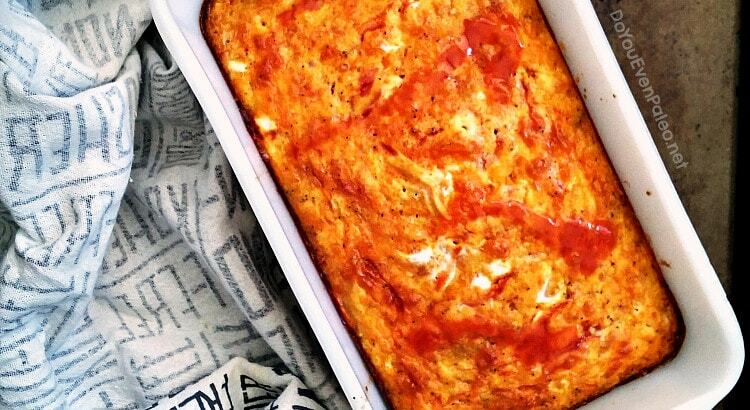 I’m glad I recreated this egg bake, because I’m pretty sure it’s going to become a staple. I love that it’s full of protein and carbs, because that makes it perfect for eating after a hard CrossFit workout. I’ve realized lately that I haven’t been eating nearly enough carbs, so I’m really trying to up the ante in that department and make sure I always eat carbs and protein after training. Paleo is not by default a low carb diet. I’m not sure where the fear over carbs started. It’s true that the SAD (Standard American Diet) features waaaay more carbs than is necessary, but you’re cutting out the excess when you cut out grains. Don’t fear sweet potatoes! For whatever reason, those who follow paleo are able to shake their fat fears but too many are still hanging on to this fear of carbs. Back to the egg bake. It tastes great cold or reheats well – just another reason it’s great for postworkout. I made a batch on the weekend and ate it throughout the week, and it tasted great every time! Enough blogging. Time to give the kitties long, long hugs before leaving them for 5 days. It’s the hardest part of vacation, folks. For real. This unusual-sounding breakfast combo is crazy addicting, and only uses 5 ingredients! In a small bowl, add hot sauce and ghee to shredded chicken breast. Set aside. In a medium bowl, whisk eggs. Add sweet potato and whisk until relatively smooth (there might be some sweet potato clumps, but that’s fine). Finally, add the chicken and stir to incorporate. Pour into a loaf pan. 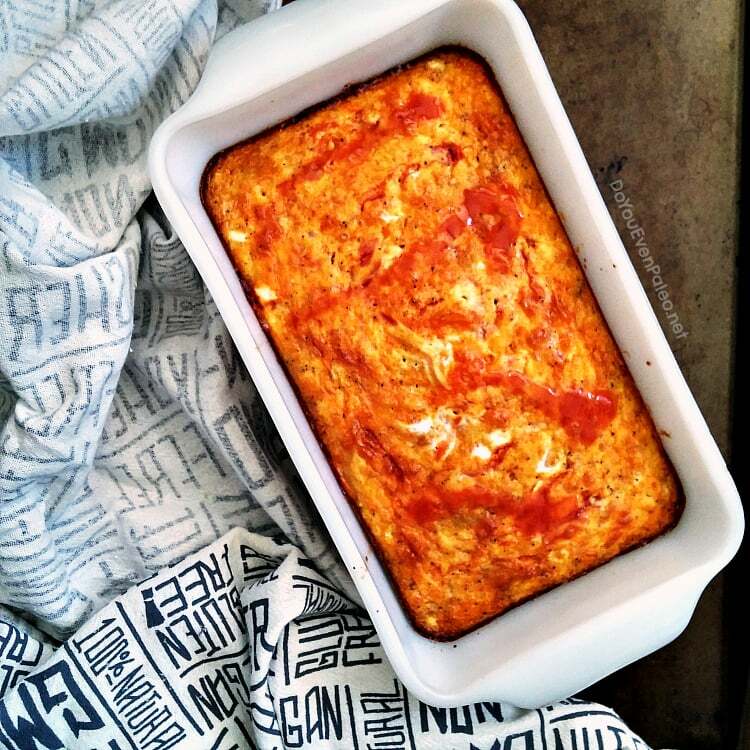 Drizzle with additional hot sauce if desired and bake for 30-40 minutes or until eggs are cooked through. What size pan did you use for doubling it?? To double it, I would probably use 2 loaf pans. I haven’t tried it, but you might also be able to use a square baking pan – if you do that, though, you might need to decrease the cooking time slightly since the egg bake isn’t as thick this way. I’ve got this on my menu this week. But I want to omit the hot sauce mixture. Have you tried it with any other sauce creation?? Is it too bland/dry without it?? While omitting the hot sauce mixture is a pretty substantial change to the recipe (it’s not “buffalo chicken” without the hot sauce), I’m guessing the end result wouldn’t be too dry. I’ve never tried it without the hot sauce or a substitute sauce, so I can’t remark on the flavor in the end. I’m not a fan of hot sauce either, but I think 1/4 cup of salsa with 1/4 to 1/2 tsp of hot pepper flakes would be pretty tasty. I already got my groceries for this week, so I’ll try this in a week or so. What an awesome breakfast! !! I didn’t have any sweet potatoes on hand so I used canned pumpkin… it worked perfectly! Can’t wait to try it wit the sw. pot. I think the sweetness would be good in this too. This may be breakfast, lunch and dinner! !!! Pumpkin is such a great idea! I have a can of pumpkin on hand too…I may have to try that next time. Thank you, Dorena! Don't subscribe All Replies to my comments Notify me of followup comments via e-mail. You can also <a href='https://www.doyouevenpaleo.net/comment-subscriptions/?srp=616&srk=87505361eee98908ddf6ccb8681f50d6&sra=s&srsrc=f'>subscribe</a> without commenting.